Cairo Festival City .... offers spectacular shows at night. Leading water feature design studio Fluidity Design Consultants has joined hands with Crystal to complete a major project for the Cairo Festival City, a new mixed-use urban community in Egypt, owned and developed by Al-Futtaim Real Estate Group. The fountain was conceived by Fluidity Design Consultants, with equipment being provided by Crystal, a world leader in water feature technology. Aquacare, the specialist MEP (mechanical, electrical and plumbing) contractor, was also instrumental in delivering the project. It played an important role as the installation contractor, assisting in the overall construction management of the water feature. The animated fountain puts on stunning theatrical shows of water and light, which can be programmed with music to entertain the public, said the company in a statement. Located in the centre of Cairo Festival City, the fountain is the city’s main focal point. It is surrounded by a horseshoe shape of two-storey retail pavilions that have coffee shops, cafes and restaurants on the ground floor level, with outdoor landscaped seating areas where visitors can enjoy views of the fountain. The festival city, spread over a 3-million-sq-m area is located at the gateway to New Cairo City, the newly built satellite city, east of the Egyptian capital. Directly opposite the retail pavilions is an open-air theatre, with the water feature being the main stage. Amphitheatre seating looks down onto the fountain, providing a place for the public to relax and watch the fountain’s inspiring shows. A key objective was for the water feature to differentiate Cairo Festival City’s retail offer from other competing schemes, as well as providing an exciting “heart” for the overall mixed-use project. Crystal said it had provided hundreds of LED (light-emitting diode) lights and 27 custom plume jets. The fountain also features 42 of Crystal’s custom-developed Titan Jets, which shoot water 25 m into the air for memorable effects, as well as creating arches that change their shape and height. The LED lights also ensure there are spectacular shows at night that work in conjunction with music. Jim Garland, the president of Fluidity, said: "In a country that is famous for its ancient construction wonders we wanted to deliver something truly special. The water feature is circled by seating areas, meaning it can be viewed from a 360-degree angle. It therefore had to look spectacular from all angles - a simple front and back view was not an option. This saw us use various 3D models and structures during the design process to understand how the fountain would be seen from all viewpoints." “Usually so-called ‘dancing’ fountains simply connect with the beat of the music. However, this water feature is different in that it really visualises the music’s melody and has much more rhythm in how the water and lighting effects engage with the music,” explained Garland. Zeyad El Beshry, the general development manager at Al-Futtaim Real Estate Group said: "We wanted an exciting water feature that would essentially brand Cairo Festival City as a memorable destination, and generally increase footfall in the retail area." "The fountain has succeeded in doing this, and adds another dimension to the overall development - its popularity is demonstrated by the crowds it draws," he remarked. According to him, every fortnight promotional events such as fashion shows are held in the external theatre, with the water feature providing the perfect dramatic backdrop. "We are already programming the fountain to create 25 new musical water and light shows. The reason the fountain has turned out to be so impressive is due to the excellent collaboration between all members of the project team when designing and constructing the fountain,” added El Beshry. 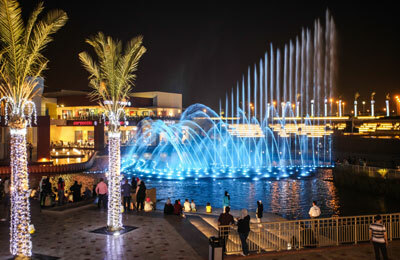 Paul L’ Heureux, the CEO of Crystal, said: "The water feature was a significant part of Al-Futtaim Group’s master plan. We are pleased to have played an important part in delivering the project, and to have installed some of our most innovative new equipment such as the Titan jets."